Get a sense of the local culture at Sarkanniemi Theme Park and Tampere Art Museum. 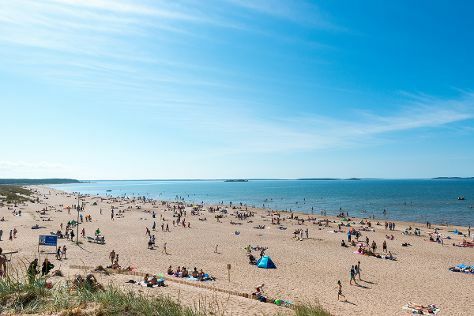 Visit Yyteri Beach and Rauhaniemi Beach for some beach relaxation. Change things up with these side-trips from Tampere: Kurjenrahka National Park (in Poytya), Juselius Mausoleum (in Pori) and Haemeenlinna (Hame Castle, Aulanko, & more). There's still lots to do: look for all kinds of wild species at Hatanpaa Arboretum, examine the collection at Spy Museum, steep yourself in history at Amuri Museum of Workers' Housing, and take in panoramic vistas at Pyynikki Park and Observation Tower. To find reviews, photos, other places to visit, and more tourist information, you can read our Tampere trip planner . If you are flying in from Sudan, the closest major airport is Tampere-Pirkkala Airport. In January, daytime highs in Tampere are -5°C, while nighttime lows are -12°C. Wrap up your sightseeing on the 24th (Thu) to allow time to travel back home.